08:31AM EDT - Hello all! 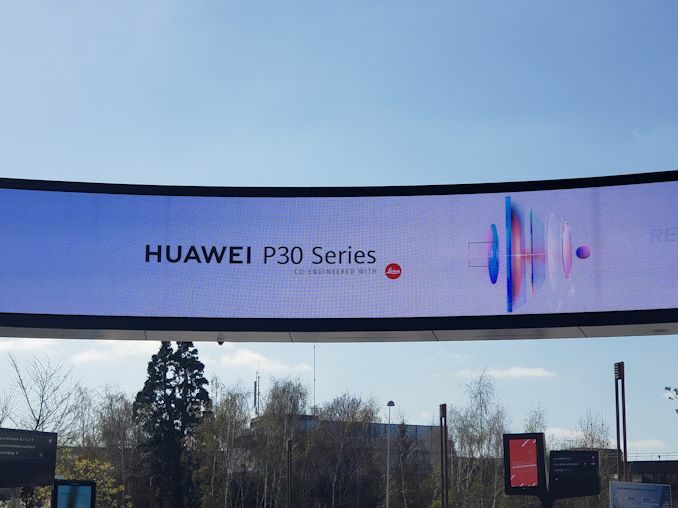 We're live here from the Paris convention center for the launch of Huawei's P30 smartphone lineup. 08:35AM EDT - This is the second time Huawei has launched a flagship in Paris. Last year we saw the launch of the P20 and P20 Pro which ushered in a new era of smartphone photography. 08:36AM EDT - In particular, the P20Pro ushered in a new era of smartphone photography with the introduction of a tripod-less night mode as well as bringing some impressive sensor technology to the table. 08:37AM EDT - Huawei's P-series have focused on photography, while the Mate series is the lineup where Huawei introduces new technology such as the newest generation Kirin chipsets. 08:39AM EDT - The venue here rivals the size that we're used from Samsung's launches. In a sense, this is a good representation of where Huawei is in the mobile market nowadays. 08:40AM EDT - One bonus point for the Paris convention centre: It seems like the venue WiFi is holding relatively strong even though I'm seeing tons of WiFi hotspots around. 08:45AM EDT - The event should start in 15 minutes. I'm expecting a long presentation by Richard Yu. 09:00AM EDT - One minute to go. 09:02AM EDT - Intro video hyping things up. 09:02AM EDT - "P30 - Rewrite the rules of phography"
09:03AM EDT - Telefonica executive talking about the P series and Huawei's advances. 09:05AM EDT - Next in line - Orange. 09:05AM EDT - "Turning point in the industry; 5G and foldable devices"
09:05AM EDT - "The P30 are a rainbow of devices"
09:06AM EDT - Richard Yu taking the stage. 09:07AM EDT - Leading innovation in a variety of topics. 09:08AM EDT - "Building a better connected life means a better community"
09:10AM EDT - First in the industry to introduce a dual-camera. 09:10AM EDT - Last year with the P20 - first with a triple camera. 09:10AM EDT - Introducing the P30 and P30 Pro. 09:11AM EDT - "Rewrite the rules of photograph"
09:12AM EDT - "Design inspired by nature"
09:13AM EDT - Minimal notch and bezel design. 09:14AM EDT - Fantastic screen-to-body ratios on both the lower end P30 and the P30 Pro - much less than the iPhone XS & XR. 09:15AM EDT - Also much lighter designs. Notably missing from the comparison are the new Galaxy S10's which are lighter. 09:15AM EDT - Under-screen magnetic earpiece speaker. 09:15AM EDT - New under-screen fingerprint with 30% better unlock speed. 09:16AM EDT - 1080p OLED isplay on the small P30. First time we see an OLED on the lower range model. 09:17AM EDT - Also a 1080p OLED screen on the P30 Pro - odd lack of 1440 on the bigger phone. 09:17AM EDT - Nano optical colour finish. 09:21AM EDT - 40MP new generation main sensor, 16MP wide angle and a 8MP 3x telephoto on the P30. 09:22AM EDT - The P30 Pro has a similar camera setup, but now has a 5x optical zoom periscope telephoto lens. 09:23AM EDT - Huawei has abandoned a RGGB Bayer sensor in favour of a RYYB sensor. 09:24AM EDT - Yellow captures both red and green light, and the ISP reconverts data back to RGB data. 09:25AM EDT - Again a 1/7" sensor for the 40MP sensor, currently the biggest in a smartphone today. 09:27AM EDT - Better light capture than your eyes are even capable of. 09:29AM EDT - Pictures done with the handheld Night mode. 09:31AM EDT - The long exposure modes are enables through AIS "AI imagine stabilisation"
09:33AM EDT - 3x Optical zoom on the P30 with 5x hybrid zoom. 09:35AM EDT - OIS on the P30 Pro telephoto seems to be implemented on the prism. 09:36AM EDT - The P20 Pro and Mate 20 Pro already had the best telephoto modules in the industry - Huawei is currently just showing off with the new modules on the P30. 09:42AM EDT - Now turning off the light in the room. 09:44AM EDT - Not using the low light mode on the Galaxy S10. 09:45AM EDT - Now addressing the new ToF camera and how it's used for depth information. 09:45AM EDT - We already saw this on the Honor View20 - however the issues were that we lacked any sensible use-cases for the module. 09:47AM EDT - Wide angle module just like on the Mate 20's. 09:49AM EDT - More and more video are using video sharing. 09:52AM EDT - Dual video recording with both a wide angle and regular camera. 09:54AM EDT - "Unrivaled camera experience with the P30"
09:59AM EDT - A new filesystem "EROFS" bringing significant upgrades over EXT4. 10:05AM EDT - Gesture navigation - unfortunately I find Huawei's side swipe implementation one of the worst among vendors. It's inferior to bottom up gestures. 10:06AM EDT - Samsung should take note. 10:07AM EDT - Huawei seems to have some limited use-cases for the ToF sensor such as a object volume estimation application. 10:08AM EDT - Covering Share OneHop with the Huawei Matebook - we had already covered this at MWC and CES. 10:09AM EDT - Use the P"à as a digital car key. 10:18AM EDT - Huawei also their own wireless headphones with the FreeLace and new FreeBuds Lite. 10:24AM EDT - Partner talking about ... designer stores selling eyewear. I'm not sure why this is part of the event. 10:34AM EDT - Wirelessly charging pouch for thet glasses. 10:35AM EDT - The glasses seem to be able to be used for music devices as well as assistants. 10:37AM EDT - 799€ for the P30 and 999€ for the P30Pro, respective starting prices. 10:38AM EDT - That's a wrap folks. I'm off to get my devices and get back home! In the US of A, is this 9AM EST, or 9AM DST ? Conversely, would that be 1PM CST or 2PM "Central European Daylight Savings Time" ? Or, technically being that the EU "Springs Forward" this weekend, NOT "European Summer Daylight Savings Time" .... ? What about Australia, Brazil, Canada, Mexico ... China ... Russia ... ? Anybody else here remember the FujiFilm f30 pocket cam? The one with the gigantic hexagonal GREEN pixel? Either yellow isn't the bee's-knees (considering it's been 15 years) or these companies aren't hiring/listening to engineers. In fact, the only other time I remember yellow being touted was years ago with IGZO displays.... not exactly a sensor obviously. Ok so here's my other problem. I've never-ever in the past 20 years seen a real article on Kodak's patents biz. Not a real one. None that could explain why my 15 year old (maybe more) Kodak DX6490 could produce better out-of-the-box pics than any other camera since... in daylight though. And I do mean ANY other camera.